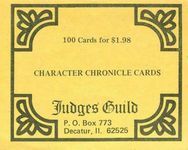 Character Chronicle Cards are a valuable aid for judges and players of Fantasy Role Playing Games. They can be used in several different manners and are designed to fill the needs of any Fantasy Game System. A pack, or deck, of 100 cardstock small character record sheets. The cards were "wrapped" with a title card and an informational card. The primarily are interesting as a very early example of a "generic" character record sheet.